These exciting camps are full of hands on activities that are bound to thrill and amaze any child interested in our marine world. Based on Ireland’s beautiful east coast, we introduce children to a whole host of sea creatures, including baby sharks, rays, starfish, crabs and lots more! Kids also get a chance to discover nature outdoors with our enthusiastic and experienced team of marine biologists. Planned outdoor activities include tide pooling, sand castle competitions, shark eggcase hunts and even seal watching! 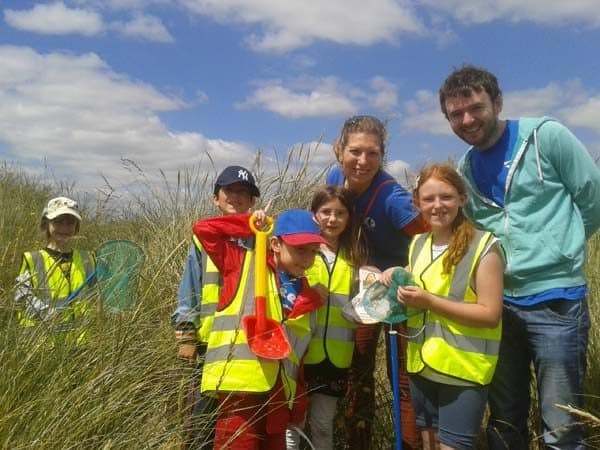 – Qualified marine biologists and small class sizes (supervisor-pupil ratios of 1:8 or less) ensuring the best possible learning experience for your child. – A touchpool containing live sea creatures, including starfish, shrimp, anemones, crabs and sea snails. – Seashore safaris and beach trips, including a sand castle competition and lessons on how to recognise and identify sea animals. – Birdwatching. seal watching or porpoise watching excursions (land based) with good quality binoculars and a spotting scope. – *A visit to the Sea Life Centre in Bray with a guided tour of the aquarium. – Participation in our citizen science programme and marine conservation projects, eg. our Shark and Ray Eggcase Sightings Scheme. – Arts and crafts activities, including a class on how to make shark and ray eggcase necklaces. *This activity is only available on camps based in Bray. Most of our marine biology courses are based in Bray, a charming Victorian seaside town situated in County Wicklow on the east coast of Ireland. These courses involve a visit to Bray Head Special Area of Conservation, a fantastic land-based viewpoint for observing seals, dolphins and porpoises. We also run kids camps in North Bull Island Nature Reserve, which is also a UNESCO Biosphere. Another fantastic location for teaching budding marine biologists! “Superb week for my 10 year old. He has an insatiable appetite for all things marine and came home every day with stories and titbits of knowledge. He loved both the sea safaris and the class work. It took about 15 minutes to settle him in on the very first morning and then he literally ran from the car without saying goodbye the other days. Hugely recommended.” – Joy Redmond. “Thanks so much for a fantastic week. Devin has voted it “best camp ever” and came out every day bursting with stories of the things he had seen.” – Sinead Connolly. “Adam really had a fab time, so thanks to you all.”- Katie Donelan. “Luca LOVED the summer camp!!! He has been drawing whales and sharks all weekend! !” – Tony O’Brien. “Leo enjoyed the course very much. Thank you!” – Julie Fortune. After much consideration, we have decided not to run any courses over the summer this year as we need the time for fieldwork on other projects while the weather is more favourable. We are disappointed not to be able to run the camps as we know how much the children enjoy it every year. However, we do hope to develop some online resources for parents with junior nature enthusiasts, so please do sign up to our mailing list below if you interested in being kept informed.